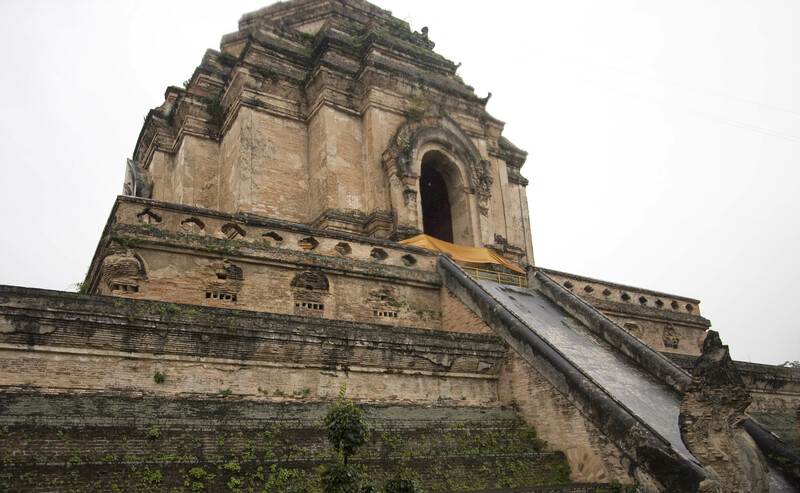 Wat Chedi Luang, one of the billions of Buddhist temples in Chiang Mai. After a whirlwind two days, I’m finally (relatively) settled in Chiang Mai, Thailand. I arrived in Bangkok late Wednesday, where Matt of Nomadic Matt fame was gracious enough to lend me his floor for the night. I spent half of Thursday running around town making arrangements for the rest of the trip. The dizzying rush of finding last-minute bus rides and plane tickets taught me a few things. First of all, in a place like Thailand where the tourists flock, there is always a bus ticket. Even though I was looking for an overnight ticket for Christmas night — the start of Thailand’s true peak tourist season with foreigners and Thai nationals all on vacation — I found one within minutes of talking to a travel agent. That leads me to my next point. Travel agents, no matter how friendly and well-traveled they are, are not your friends. The travel agent’s affable nature combined with my lack of preparation for this trip to sucker me into an overpriced tour package that seemed to be a good deal. I should’ve followed my first instincts and booked everything one step at a time. In Bangkok, I should’ve booked how to get to Chiang Mai, where I would find my accomodations and things to do. Now I’m in a relatively nice hostel called Backpackers’ Meeting Place Resident, but it’s a little more expensive than I would’ve like to have paid. Also, the bus ticket to Chiang Mai was probably a little more expensive than I should’ve paid for it. It’s also outside the city center, but it is close to an open food market, which is wonderful given my affinity for street food. Through this same tour, I’m going on a two-day trek through some jungle tomorrow complete with elephants, huts, and bamboo rafting. Should be interesting. At least when I screw up in Thailand, it only means an extra six or seven dollars a night, which won’t kill me. Six or seven dollars, however, goes a long ways in Thailand. For example, six dollars stuffs me with street food for three meals, so losing such a big part of my budget to something so stupid is rather annoying. I’ve learned my lesson for my trip to Vietnam in January. At least now I have everything set and I only have to worry about getting from scheduled Point A to scheduled Point B. The rest of the itinerary looks like this: Chiang Mai for three more days, then bus to Bangkok where I catch a flight to the islands around Koh Samui for New Year’s, then back to actually explore Bangkok for a few days.